We all know that the classic potato chip's origins are credited to Saratoga Springs. But what about its partner in crime, the club sandwich? This quintessential American staple, equally at home in a neighboorhood diner or a five-star resort, can also trace its beginnings to the Spa City. Several places have tried to stake their claim as the creator of this classic sandwich, but the most popular theory begins at the famous Saratoga Club House, known today as the Canfield Casino, a beautiful event venue that also happens to be haunted and is one of Saratoga Springs' most talked about landmarks. The gambling institution was founded in 1870 by John Morrissey, an accomplished boxer and politician. Upon opening the Club House, Morrissey instituted three rules when it came to his gambling parlor: cash only, no locals and no women allowed. The exclusive nature of his club made it one of the country's most renowned places to gamble during the 19th and 20th centuries. When Morrissey passed away, Richard Canfield purchased the venue in 1884 for a quarter of a million dollars -- that's nearly $6,650,000 today! Morrissey also purchased and landscaped the area surrounding the venue to make it even more appealing to high-class visitors from all over the country. This is known today as Congress Park. 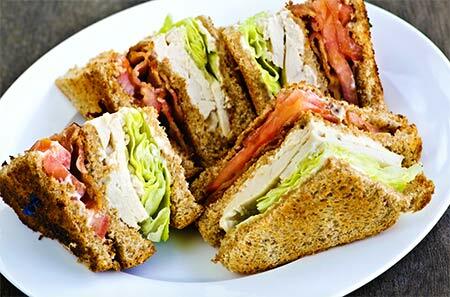 So how did this high-class gambling venue become the birthplace of the club sandwich? It's still up for debate who actually created the towering layered sandwich: the chef or the clubhouse owner, Richard Canfield himself, but The Encyclopedia of American Food and Drink states that the club sandwich originated in the Saratoga Club House's kitchen in 1894. Luckily for us, the delicious invention's recipe soon spread from the gambling tables of Spa City to the rest of the country. Hungry? Check out all the restaurants in Saratoga where you can indulge in delicious sandwiches!